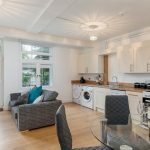 Stylish, contemporary apartment located literally opposite The University of Plymouth.. 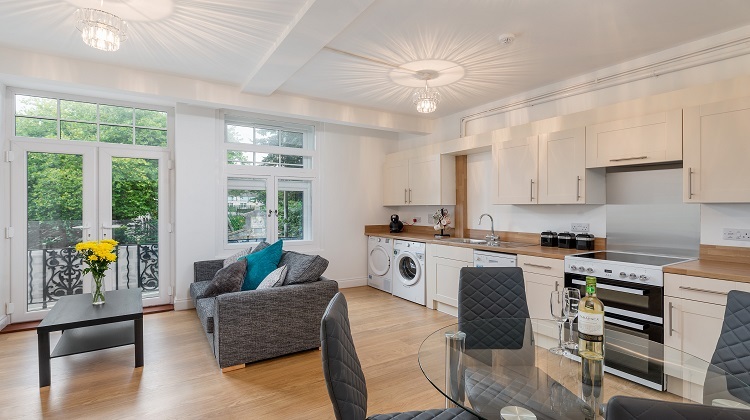 This 2 bedroom modern apartment is situated on the second floor of a beautiful character property and offers good size bedrooms with built in wardrobes and desks. The incredibly spacious open plan living area, with stunning views of the university campus and reservoir, contains a dining table with 4 chairs, a comfortable sofa and laminate flooring. In the kitchen section are a range of units with washer dryer, dish washer, fridge freezer and cooker. The fitted bathroom offers a double shower tray with LED lit shelf, bath tub, WC and wash hand basin. With the addition of hard wired virgin voom fibre internet connection and soundproofing throughout we really have thought of everything to make your apartment a real ‘home from home’. 2 bedroom contemporary apartment opposite The University of Plymouth. Exceptionally spacious apartment with view over Plymouth University and Reservoir. Set in beautiful period property with large windows and high ceilings. No deposit, guarantor or admin fees.